The Whole Brain Catalog could become the gateway to the world’s brain related online data repositories (see my recent blog “Bio-Commons a Global Challenge“). If you’ve been following my posts on the Whole Brain Catalog you’ve seen how it enables you to visually dive into a mouse brain and explore data that exist on different scales such as brain cells (neurons) and protein molecules. Today you’ll look at a network of cells in the thalamus and cerebral cortex and then you’ll watch a simulation of the neural network’s activity. A thalamocortical network is displayed in the Whole Brain Catalog. Go to the Data Type area to the left-bottom of the brain viewing area and click on the arrow to the left of “Cells.” This will open the list of cell types and groups of cells available to you. Find the “Thalamocortical Network” and check the box to the left of the label. Give Whole Brain Catalog time to download the data. Now you’d probably like to zoom in to take a look at the approximately 300 cells and thalamic inputs that you’ve placed into your Whole Brain Catalog mouse brain. Double clicking on “Thalamocortical Network” doesn’t do anything and there is no context menu available for this level. Go to a cell listed under “Thalamocortical Network” and double click or select “Zoom to” from the context menu. From there you may adjust your view to see the whole cluster of cells by using “Zoom out” or you may want to examine the cells close up. Tip: You can always zoom in and out using your plus (+) and minus (-) keys. 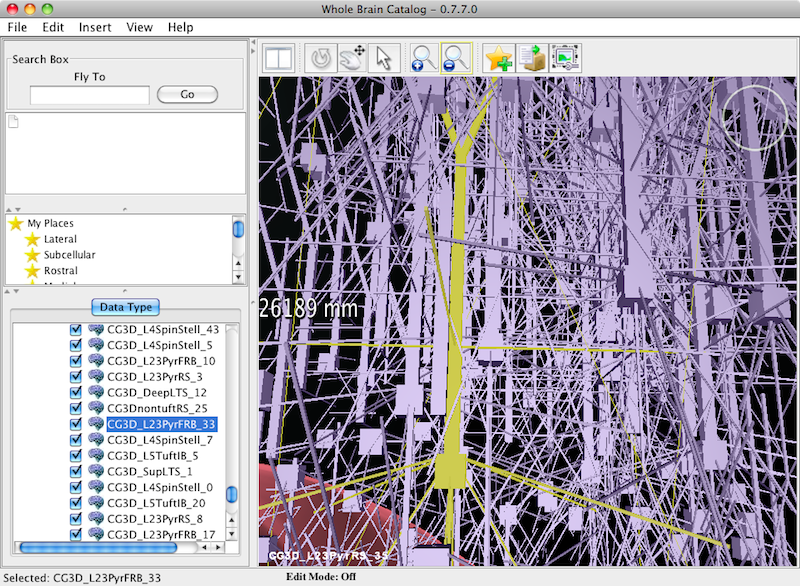 The structure highlighted in yellow is a layer 2/3 pyramidal cell displayed within the context of a thalamocortical network in the Whole Brain Catalog. Part of the thalamus and cerebral cortex are represented in the “Thalamocortical Network.” In the thalamus, neurons in the thalamic reticular nucleus and inputs from a main relay nucleus (unspecified) are present. Excitatory cell types from 4 of the 6 layers found in the cerebral cortex are present including layer 4 Spiny Stellate cells, layer 2/3 pyramidal cells, layer 5 tufted pyramidal cells, and non-tufted pyramidal cells. Tip: Change the direction you’re looking by using your arrow keys. Now let’s view a simulation of the thalamocortical network. You need to download a data file to do this. 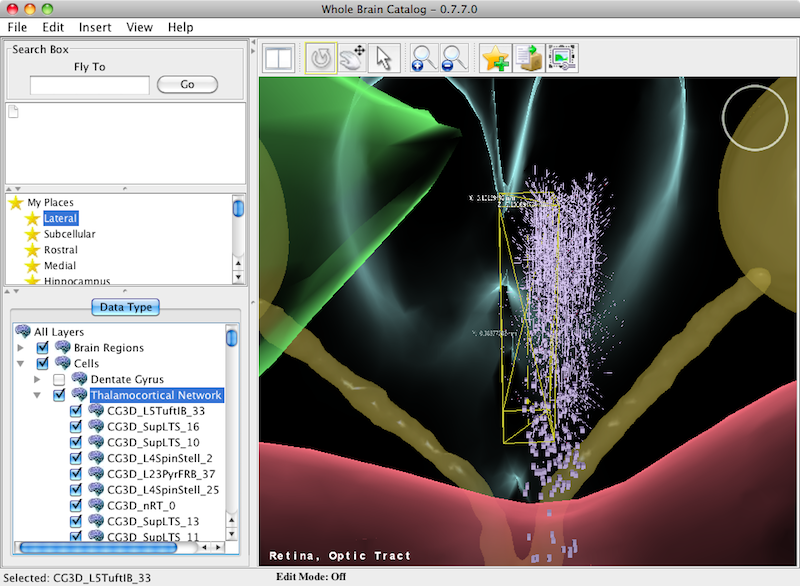 Download the ThalamocorticalSimulationData.zip file from the Whole Brain Catalog website by clicking here. Place the downloaded file into a named folder you’ll remember (like WholeBrainCatalogData) and then unzip the file. When I unzipped the file a folder with a big long alpha-numeric label appeared, which is a good reason to open the zip file inside a well labeled folder. Open the context menu from any of the cells listed under “Thalamocortical Network.” Select the “Animate Network” menu item and an “Open” file dialog box will appear. Find the folder you placed the simulation data into and double click on it. Then double click on the data folder name inside to show a list of XML data files. Select any one of these data files and then click on the “Import File” button. Whole Brain Catalog will load all of the data files so please be patient. Note: Running the thalamocortical network takes significant computer power. You may find that the visualization runs slow or even blacks out if you don’t have a powerful enough computer. Note: To turn off the animation you select “Animate Network” from the context menu again. However, this didn’t work for me. The open files dialog box appeared again for me. I clicked the cancel button and the animation kept running. The features of the Whole Brain Catalog you used today are an impressive start. Nevertheless, there are many areas we should see improve in future releases. For instance, the location of the thalamocortical network within the brain makes no sense. The cells should be found in their appropriate anatomical locations. Also, showing animations of simulations using special data files is a first step towards the ideal of running and visualizing actual simulations based on neurobiological data within the context of the Whole Brain Catalog. This entry was posted in Brain Science and tagged Brain Science, Open Data Repositories, Semantic Web on November 1, 2010 by Donald Doherty.